The furnace in our place is 20 years old ( same age as house). It’s 1,800 Sq Ft home, Lennox, probably a mid efficiency furnace I’m guessing. It has never given any trouble but I do worry about it breaking down now and then right when it’s needed most. As with most things like this, if it breaks during a cold snap it can be a disaster, as at that point you have no option to do much shopping around – plus it could be more expensive. It also gets used during the summer for the AC. I’m assuming if I replace the furnace it will have to be a high efficiency one, any idea which companies to check out, or how much on average it would cost ? If the quote are reasonable I might just do that this summer. Why don't you have some one come and look at your furnace or maybe have it serviced. You could then ask them what the general condition of your furnace is. Who knows, it may have a few more years in it. When it comes to furnaces people start thinking it's about time they got a new one on say a 30 year old house. If a house does not have air conditioner their furnace is only being used in the winter. If it's 30 years old it's only been working 15 of them. Anyway, I think it would probably be about maybe $4 to $5 grand if you went with a new furnace. I get flyers in my Direct Energy bill offering furnaces where you can pay monthly for them. Not sure how that works and I think when a person goes that route they may end up paying more. To Top_Dawg's knowledge, installation of a good quality new furnace is now in the $7,000 to $8,000 range. Plus the obligatory $6 for tube of KY whenever a plumber is involved. while they won’t clean or repair or replace a furnace, atco gas will inspect them and let you know what condition they’re in and if they’re in good working condition or if repairs are necesssary. at least then you know what you’re dealing with and not just guessing. it can take a long time to recover the cost of a new furnace, particularly when the new high efficiency can’t use the same chimneys and flues as the old one. if you save $50 a month 7 months of the year it would take 20 years to break even in a new $7,000 furnace. the unknown is how much you might get in rebates from the province or the feds and let that determine your timing for you if the old one is in better shape than you fear or just needs minor adjustments or parts replacement. Can someone explain to me why the new HE furnace's dont / cant use the old stacks? Thanks for the Atco tip re checking out furnaces. My neighbor got a new furnace last year and he got a government rebate. Federal rebate I think. Not sure if the program is still available. they need their combustion air direct vented from the exterior, they need their exhaust air direct vented using pcb pipe, and they need their condensate collected and piped to a drain, the latter two because their condensate is corrosive. Technically you can use the chase but the flue will need to be replaced. The combustion air is directly connected to the unit so you need a line into the Furnace. You can go concentric up the old chase and use both Flue and Combustion lines in it. Just as long as the length is not to great. I replaced my furnace a few years back with a HE unit, Venting and combustion air are out the side of the house. The stack is still in place as my water here still requires a flue. When Venting out the side of the house make sure you avoid opening windows by 1 meter. 8 grand got me a new furnace and AC unit. Atco will come out and check the heat exchanger for cracks. That is usually what goes due to rusting. Because the new high -efficient furnaces are more efficient because they take more heat out of the flue gasses, which cools the flue gasses to the point where water condenses out. There's lot's of CO2 dissolved in the water so it will dissolve your typical old galvanized flue and rot out the mortar if you have an old masonry chimney, although that should be lined anyway. High efficient furnaces are all fan powered burners, which means that they create a positive pushing pressure in the flue instead of using the buoyancy of hot air to pull the exhaust up the chimney. Because the vent is under positive pressure leaks are a bigger deal so it has to be different materials with different joints, and generally can't be tie into another appliance's chimney as the positive pressure would push flue gas into your house through the other appliance. High efficient furnaces don't have to draw their combustion air directly from outdoors but it's usually done anyway since you're already making holes in your wall, and because that way you avoid drawing it in through other cracks and holes in a drafty old house and you also avoid the chance that the burner fan might cause a downdraft in your hot water tank chimney which is bad for CO and CO2 reasons. Do all these HE furnaces have motherboards on them. I have heard if something goes wrong with the motherboard that it is very expensive to fix. Top_Dawg presumes they all do. And the motherboard is over $1,000. ^Yeah, that's what I heard $1,000 to replace one. If you have a lemon of a motherboard you could be on the hook for that amount 5 years in. One other thing. I tend to get electric shocks in the winter when I turn lights on etc. I used to have a humidifier on my furnace but turned it off due to it being high maintenance (calcium build up etc). Wish they would have a better system from furnaces for putting moisture into the air than those attached humidifiers. Seems to me that technology has not come far. I think we paid around 4K for a new HE furnace in our 1200SF bungalow a couple years ago. Maybe it was 4500. They had to add new fresh air intake from outside and redo the combustion air in/out lines. I think they redid the HW tank exhaust lines as well (didn't even ask them to do it). It was through Action furnace. I was pleased with them. Going up in size doesn't cost a whole lot more. And they are less biased! My brother is a trained gas fitter and got involved very early on in home efficiency and works in Ottawa for the Federal Government setting standards for energy efficency of appliances, furnaces and wood stoves amount other things. He found that the original gas efficency standards set in the 1980's assumed that regular gas furnaces were 60% efficency and manufacturers touted that their mid-efficency furnaces were 80 to 90% efficency. That means you could realize a 1/3rd reduction in your gas bills. Many people complained that they only found a 10% reduction but this was caused by 3 factors. First, the gas usage costs are only part of your bill so the fixed costs see no change. Third, many new mid-efficency units when tested had lower efficiencies than advertised. The difference between the old and new was as much as half the spread. Therefore the payback is far longer and with cheap gas prices, even longer again. I agree with the computer board issue. My parents 1,400sqft bungalow home had a 1965 FlameMaster furnace that she had regularly checked by the gas company. They were told that the new furnaces were not worth the cost so she kept hers until they found a cracked in the exchanger. She bought a new Lennox mid-efficiency furnace in 2001. Her gas bills only marginally improved. In the next three years the furnace ate two more boards for a total of $2,100 in parts and about $450 in service. Shortly afterwards she sold the house so I do not know the further history. Suffice to say, any improvement and cost savings in efficiency were gobbled up with the high price of maintain the furnace. The old one in 36 years only needed new filters and was still on the original v-belt. Only the couple exceptions I mentioned explicitly stated that the savings would only apply to consumption and not the total bill. It was amazing how disingenuous the whole industry is about actual savings. Last edited by KC; 29-01-2018 at 07:08 PM. It was amazing how disingenuous the whole industry is about actual savings. Only "amazing" if you expect them to have clairvoyance about your specific situation. All they can do it report how many BTUs output you get for a given volume of natural gas input. They have no idea about ow much it's going to cost to install the thing in your area, or what un-metered costs are added to your bill, or your climate area, or how drafty your house it, or anything beyond measurements at input and output. The rest is up to you to figure out. Unfortunately though, in this age of physical gizmos that you can grease and repair and whack with a wrench now being controlled by black-box "motherboards" that cannot be repaired and must be replaced as a unit for non-trivial $$$, the ROI of such devices are horribly skewed. I think furnaces are a great example of too much black-box: really, a furnace is just an enclosed flame and a fan*. My Mom's 65-year-old something-something furnace is still making heat without CO, needs a filter every year, a belt every 5 or 10, and a motor every 10 or 20. Now a black-box failure is catastrophic and completely unfixable by pretty much anyone. * Fan optional: Anyone ever had a gravity (octopus) furnace? For the original poster: Before you shell out a few grand for a new furnace of whatever sort, how about spending a hundred bucks on some caulking around draught areas, insulation plates for electrical sockets on exterior walls, and seals around exterior doors? Look at the cheap stuff first. Not really. Manufacturers are stating annual savings of installing their furnace. If you don't make any changes in your home like more insulation or weather proofing, then all you are evaluating the efficiency of the furnace and any necessary changes to the flue. If the old furnace was 75% efficient and the new one is 90% efficient, then to make 100,000 BTU's of NET heat, a 75% efficient furnace will need to burn 133,333 BTU's worth of gas. The new 95% efficient furnace would burn 105,263 BTU's of gas. That is 78 cents to the dollar spent on gas, a 22 cent saving. 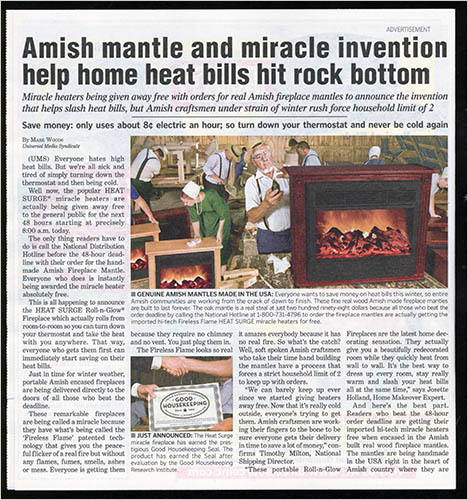 All electric heat is 100 percent efficient, so that little heater that you bought for $250 that is supposedly built by Amish craftsmen (who don't have electricity in their own home) is just as efficient as my $12 Toaster. Last edited by Edmonton PRT; 29-01-2018 at 08:05 PM. Thanks all the replies. I know that often replacing something older that works with a new more fancy furnace ( additional electronics) is no guarantee that it will last any longer. During the summer I may get some quotes, just to see. I'm not expecting to see much reduction in my gas bills as the delivery/ fixed costs are typically approx. 30-50% in winter. I did have ATCO scheduled to come our for a service, had to book it in Sept but had to cancel them at the last minute earlier this month. I would have interested to learn what they had to say. Both of these are good posts. ...I do give KC a bit of credit on the "disingenuous" point. While yes, they aren't trying to figure out your exact savings against your situation, the fact is that they are promising savings regardless of your situation. They will say that their furnace, etc will give you savings in pure consumption and maintenance vs the old one's consumption and maintenance. That means that repairs, reliability, and regular maintenance will be significantly better; thereby, costing you less money on a TCO basis. The consumption v your old furnace to do the exact same job feeding the exact same home is going to be 30-50% less/cheaper...they intentionally avoid the conversation on the reality that it is not a purely linear savings curve. Hence...disingenuous. Sealing your windows, outlets, doors, etc is an excellent first start. It may be 100% efficient, but in Edmonton electricity is 3-4 times more expensive per unit of energy than natural gas is. The 5-20% of energy you're losing out your chimney/vent isn't going to make up for that. Which is why I get such a laugh out of those Home Hardware commercials where they're pushing people to buy individual electric space heaters for their houses to save on utility costs. Maybe in Quebec and Manitoba where they've got cheap power and already do a lot of heating with electricity that would make sense. In Alberta, that'll easily double or triple your utility bills if you're keeping all of your rooms at the same temperature they were before. As far as motherboards etc. go and "a furnace is dead simple" line of thinking, that was true with the old, inefficient, extremely basic furnaces from before the 1980's. But to squeeze every last bit of energy out of the exhaust before it goes out the vent, things have gotten a LOT more complicated, and that necessitates a lot more on-board logic and controls to make sure that the home occupants don't end up dead when something malfunctions, there's unusual wind conditions outside, the vent is blocked by frost/snow/dirt/neighbor's dog, and so on. Last edited by Marcel Petrin; 30-01-2018 at 12:37 PM. It's closer to 7 times more expensive (commodity alone) for electricity than it is for NG, but we're in a period of unusually low unit costs for both. Hey guys, I was not suggesting that heating your home with a counter full of toasters was a good idea. I was merely referring to the advertising practices of some companies and their claims on efficiencies. I came up with 3-4 times the last time I compared my office's utility bills, and that was including all the other fixed and non-fixed costs. It wasn't intended to be scientific, just more for my own curiosity. In any case, electric heat is stupid expensive in Alberta. And understood Edmonton PRT; I just felt it was worth pointing out. Every now and again we get asked by developers "hey, what if we just got rid of the boiler system and heated with electricity?" because the average person is unaware of how cheap natural gas is in comparison to electricity. I wonder how the comparison runs on Gasoline vs Natural Gas vs Electric Cars in terms of energy costs. Adding the carbon tax to natural gas raises the price to $3.41 / GJ, moving the ratio back to 3.88. Still doesn't change the economics though. Anyone having problems with Furnace on a high eff 1st check surge protector fuse on motherboard these are to protect the boards do not trust your paid on commission heating guy to tell you your motherboard is fried because a fuse is a service call a board is a 250$ 1 hour fix for him. Is the fuse easily user replaceable? If so, it would make sense to keep a package of them handy to try it yourself before calling the repair guy. Yes a 5 amp is fine I would not go any higher . Not sure on natural gas, but electricity is cheaper than gasoline to the end user. Tesla's only cost about $15 to "fill" depending on the model's capacity and your utility costs, and that'll get you about 400-500 KM in range. I assumed 100 kWh @ $0.15 kW/h, which is roughly what I pay at home and at my office after all the various charges are added in. In an equivalently sized and performing Mercedes or BMW, you'd probably burn about 50L of premium at $1.30/L, or about $65. Natural gas I have no idea, but it's not particularly relevant given so few passenger vehicles are available equipped for natural gas. Cost to drive a Bolt EV on electricity for 100 km. Gas price based on $1.05/L and 7.0 L/100 km. Cost to drive a Tesla Model X on electricity for 100 km. Gas price based on $1.20/L and 15 L/100 km. Pretty close to my wild guesses! Boiler v forced air? Thoughts??? when you talk "boiler v forced air", what type of boiler and what kind of distribution are you thinking about? are you thinking about perimeter hot water or perimeter induction? are you contemplating in-floor heating? how are you planning to provide distribute fresh air/make-up air? how are you planning to control and distribute humidity or dehumidification? is there any thought at all to add or make provisions for future air conditioning? the answers to those questions - and probably others - will probably help you with your comparison but it's hard to make meaningful recommendations without them. Forced air and boilers are not mutually exclusive. The boiler can provide heating water for a fan-coil or several to provide the forced air heating, along with radiant loads (whether that be in-floor, baseboard, ceiling panels, exterior snowmelt, etc etc) and domestic hot water provision with an indirect fired tank. Cooling would be provided by exterior condensing units and DX coils in the fan-coils. I'd wager that many if not most high-end homes these days are actually powered by boilers that handle everything as opposed to separate furnaces, hot water tanks, and the like. Although that's not my market at all, so don't hold me to it! Hmm. "Gas price based on $1.20/L and 15 L/100 km." The average fuel economy in 2008 for new cars, light trucks and SUVs in the United States was 26.4 mpg US (8.9 L/100 km). The second chart is specifically for an SUV, and while 15 L/100 km is probably on the high side, is not unreasonable for SUV's in the 5-6,000 lb class, which is where the Model X sits. The first chart uses 7L/100 km, which is appropriate for comparison to a compact like the Bolt. Ahh right. I was too quick to react without actually looking over the graphs. My mistake. So now that I’m looking, why the higher fuel cost for SUVs? Is the model X that big? Or just that heavy? Yes, a boiler and forced air are not technically mutually exclusive. Geothermal forced air can be applied too. However, the layperson looks at a boiler being either in floor or perimeter heating. Forced air is the traditional tin bashed ductwork into a heat exchanger powered by some fossil fuel. I tend to agree Marcel, the newest top of the line homes do the all in one set up. I was more wondering if people preferred a radiant heat set up or forced air? The place I am designing has a larger center area, all open, with 2 wings that house bedrooms, office, etc. I am thinking of zonal heating and that is best accomplished with a radiant set up. However, some people lament the maintenance of a boiler/radiant heat. I was wondering on people's experience with either. For me, the central area will have a large fireplace to heat with wood as much as I can as I love that heat. The rooms/office would be radiant, and the main area would have a radiant zone as a backup. The S and X are both pretty heavy vehicles because of their massive battery packs. Depending on the battery size and number/size of electric motors, the X is around 5-6,000 lbs. The S is a bit lighter. Many of the high end systems do both, with in-floor heating individually controlled per room and then a hydronic fan-coil to act as second stage heating and DX cooling in the summer. Keep in mind in-floor doesn't play too well with certain flooring types. If you're a big fan of 70's shag, you might be out of luck! Ground-source geothermal is kind of a non-starter in Alberta in terms of viability, given our electricity costs. It just doesn't make much sense, for better or worse. If you're doing a big PV system with battery back-up and no grid tie, then it might make sense. HA...70's shag...hell no. Not in a log home. I am looking at building out of local logs...as I am about to inherit a crapload of them from a clear cut powerline ROW. I'm not sure if they do new furnaces or not but I've worked with Harmcor Plumbing & Heating for furnace repair and they did a great job.